New ListingVintage DYNACO A-25 Speakers - Excellent Condition & Sound Awesome! Power Capacity: 60 Watts. 2 Way – 2 Speaker System in a Bass Reflex Enclosure in an oiled Walnut Finish. Bose 901 series V speakers. Shipped with USPS Priority Mail. Fully functional, still in use, with active equalizer. Driver all intact, no tears. Beautiful condition. Very nice shape. You have to look hard to find any flaws with these. Very Nice set of the highly regarded Genesis 44 speakers by Genesis Physics. Genesis Physics traces its roots back to EPI and has a similar sound. These have new woofers (Pro1) from Hue himself at Human Speakers and the passive radiators sound wonderful. Each speaker weighs 1 lb. (845 grams). Speaker impedance is 16 ohms and rated at 20W. Stamped on the rear base of the horn is 6638. No PO Box. 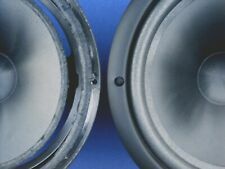 New ListingAltec Lansing 806A Horn Drivers Pair Working Original Very Nice! Make and Model: Altec Lansing 806A Horn Drivers. Condition: These are very nice. Really clean. A few minor blemishes. See photos! Tested at 7.7 OHM. LC-R-5093 A B (12/LB-6x13x13) ER. Salesbaron is in Los Angeles, 90039. THEY HAVE BEEN TESTED AND WORK GREAT EXCELLENT SOUND. CONDITION: Speakers sound great. See pics for best detail. You get nothing more nor nothing less than what is pictured. Very nice pair of original Dynaco A-10 bookshelf speakers. One owner, smoke free studio. Matching numbers on stickers. Best pair I've seen in years. Each speaker has a 15" woofer, horn" midrange, and a horn tweeter. woofer surrounds are new. PAIR REALISTIC MACH ONE SPEAKERS. they are nearly perfect.one owner, one house, excellent ! Here are two JBL model 2142H coaxial 12 inch full range speakers in very good cosmetic condition with excellent original cones. No tears or holes or creases. Tested and sounding very nice. No voice coil rubs, buzzes, or distortions. Tweeters work as they should. Included are the metal baffle boards shown in the photos. Perfect for your next project. Shipping is $24 to the lower 48 US states, and more for other locations. New ListingTHE ADVENT LOUDSPEAKER: HENRY KLOSS SPEAKERS. VINTAGE FLOOR STANDING SPEAKERS. THE ADVENT LOUDSPEAKER HENRY KLOSS SPEAKERS TWO VINTAGE FLOOR STANDING SPEAKERS SIZE: 14x25x11 INCHES - approx WEIGHT: HEAVY, VERY HEAVY SO LOCAL PICKUP ONLY - SORRY! Speakers are in very good condition with a few scratches on the cabinets. Both components of both speakersare in excellent condition and the sound quality is immense. Speakers located and must be picked up from Potomac, MD. Buyer can if they so wish arrange a delivery service at their own cost and risk. Just paid to have new surrounds put in due to age. I have also pictured the bottoms of the cabinets so you can see they weren't moved around a lot so the bottoms are really nice. Like most free-standing speakers, the M-905 gives its best performance when it is placed at least a foot from the wall and angled slightly inward toward the listener. 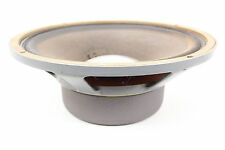 Many speaker manufacturers claim unique qualities for their creations, which only too often turn out to be "just another speaker.". These speakers have been upgraded to L-100 tweeters & speakon connectors installed. They sound incredible. Lower 48 US only. These are in excellent all original condition and sound great. Consecutive serial numbers 113592 & 113591. 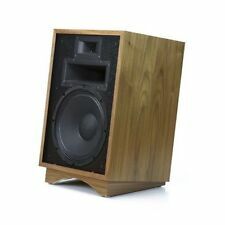 New ListingJBL L-100 Classic Loudspeakers ( A One Owner Pair ) NICE! These are a one owner pair and are in fantastic all original condition. Even the grill foams are original. It is hard to believe the grills still look this good after all these years. They are a little brittle, but still look good and are very presentable. 15" Full Range BiFlex Drivers 8 ohm. 420-Y 420A. The other one is complete with tweeter but has a tear in the full range cone as noted in the pictures. I think this can be repaired carefully. One is in great shape but has a missing tweeter. The cone moves freely without any rubbing sounds. Good Bass for its Era. More like 8 Ohms. KLH Model 5 Speakers. . Shipped with UPS Ground. UTAH SPEAKERS. 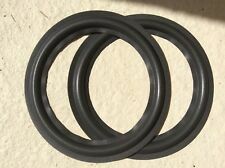 8 ohm, 50 watt, ceramic magnet, matched set. Nice working great cabinets nice. New grill cloth. Each one is loaded with two 575347 high frequency Horn Drivers. They are arrayed in the front. You get the set. Both have been tested and both work great. High frequency only. Don't look perfect, but not too bad. Local pickup is fine. 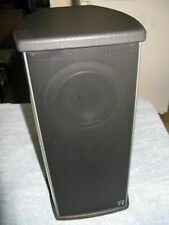 Polk Monitor 7 Pair , Peerless Tweeters, Great Sound, Very Good Condition. Very good condition, minor defects, very presentable. I do not know what to call the finish, very dark walnut?. This pair sounds fine without recapping the crossovers, I have recapped many crossovers in older speakers and have heard a difference only twice. Also, there is a very small chip (1/16" W x 1/4" H) on the back corner of one of the speakers (see picture). Besides a couple other nicks these are the noticeable flaws in the cabinetry. Woofer surround needs to be replaced. Vintage JBL 4410A Studio Monitors Series Speaker. Sansui SP-M1 stereo speakers in wood cases with wooden latticework grilles. These are 2-way, 2-speaker with impedance of 8 ohms and max. power of 50 watts. They are in really good to great physical condition. These speakers sound amazing 50-150 watt power handling and they are in perfect shape. acoustic research Phantom speakers L And R 5.2c . They are in excellent condition and they sound wonderful. They have abeautiful factory hand rubbed oiled walnut finish. The frequency response is 50-20,000 hz and they are rated @ 80 watts (8 ohms). Hi, Here's an 8" full range speaker made by JBL for Ampex. The speaker works great and sounds great. There are no tears, holes or voice coil rubs. It has a large magnet assembly, especially for an 8" speaker. Stephens Trusonic 120 FR 16 Ohm Speakers (Pair). 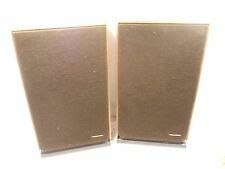 University C15W Woofer Pair, Excellent Condition! Excellent condition pair of University C15W drivers, See pics, each driver is 24lbs. variable impedance, 6 lb Alnico magnet, So quality is there. These are tested and are fully functional. Only issue is 1/8" hole in one drivers surround, see pic. This is a very nice pair of EPI 100v Speakers in Excellent Condition. Very little use in a second system. Well cared for and wood oiled monthly. I think that is why they held up so well. Don't demand a ton of power. This is a Pair of Heathkit Drivers #401-149 made by Altec Lansing for the Heathkit AS101 Speaker System with is a clone of Altec Lansing Valencia 846A. The Altec Lansing Driver designation for these drivers is 416A - 8 Ohm. 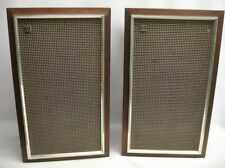 Vintage DYNACO A-25 Speakers - Excellent Condition & Sound Awesome! Altec Lansing 806A Horn Drivers Pair Working Original Very Nice! Vintage speakers can go well with a variety of home audio systems. If you have a nostalgic look to your home decor, these vintage components may fit in well with your home theater system. These loudspeakers can be small enough to fit on a bookshelf or large enough to sit on the ground, looking similar to furniture. What is a vintage speaker? Vintage speakers debuted in earlier decades, such as the 60s, 70s, and 80s. There are original vintage loudspeakers from the 40s and 50s as well. One example of a vintage speaker is a large boxlike cabinet that was manufactured in the 1970s. These audio system components can have a basic retro design that fits well with a lot of vintage home decor. How can you tell if a speaker is vintage? Large versions are usually built into a large two-foot wooden box that is big enough to provide bass and surround sound as part of a home entertainment system. Look for the manufacturer's date code stamp. That will tell you how old it is. Small vintage speakers usually have a simplistic, round design and will not be encased into anything. How do you connect old speakers to a stereo? Set the speakers where you want them in the listening area. Make sure that the distance between the two and your listening area is the same because you will get equal sound from both this way. Take some wire and use just enough of it to cover the distance between the stereo and each of the speakers. There may already be wire that came with your stereo. If the amplifiers are built in, then there will be slots for the left and the right. Put the wire into the corresponding slots on the speakers so that it matches what is on the receiver. If no amplifier is built in, you'll have to connect a separate amp. After the wires are all connected, plug in all the equipment and test out the sound. How do you test old speakers? After you buy these vintage audio components, you will want to test them out to make sure that the sound is sufficient. The way to test them out is with an Ohm meter. If the Ohm meter registers something when the audio or music is playing, then the speakers are functioning. Then, you will be on your way to listening to your favorite records or enjoying your home theater system.